"Dog glaucoma is one of the most common causes of blindness in dogs. It is a condition where fluid builds up in the eye causing an increase in pressure. 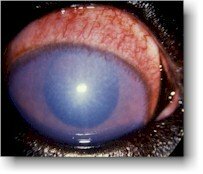 It can be inherited or caused by eye inflammation or trauma. Treatment options include medication or surgery. New surgical procedures involve the use of surgical implants. Severe or acute glaucoma requires immediate treatment to avoid vision loss." Glaucoma is a condition where the fluid pressure in the eye is higher than normal. It results in loss of vision and can be painful for your dog. The condition is progressive meaning it gets worse over time. Glaucoma in dogs is caused by pressure from a build of fluid where the iris meets the cornea. When the fluid doesn't drain normally, pressure builds. The condition is either inherited (primary glaucoma) or a result of another disease (secondary). If the glaucoma is severe (acute) then emergency treatment is needed to relieve the pressure. Not doing so can result in vision loss. Canine glaucoma is difficult to diagnose. A device is used to measure the pressure. Accurate readings are influenced by the breed, time of day, restraints and age. For this reason several readings are often taken. There are over 40 breeds where glaucoma can be inherited (called primary glaucoma). Dog glaucoma is a condition where pressure builds in the eye resulting in pain and vision loss. Other clinical dog eye symptoms include lethargy, appetite loss, eye redness, and enlargement of the eye. Glaucoma in dogs is difficult to treat. Treatment includes oral and topical medications. Surgical options include laser surgery and cryosurgery to help drainage or insert a drainage device. If treatment is not an emergency, the medications will be tried first to see if the eye pressure (IOP) can be brought into normal range. Your veterinarian will need to monitor your dog's eye condition every 2 weeks for the first month. If eye pressure cannot be controlled then surgery may be needed. There is a new surgical approach called TR-ClariFEYE, which is a 30 minute procedure involving an implant which is inserted into the eye. The device can help to control pressure in the dog's eye and can lead a reduced need for topical eye treatment. If you dog is in pain then the eye may need to be removed (called enucleation) or replaced with silicone. Even with surgery and medications, irreversible blindness may still occur. Glaucoma: What Can I Do Before I Send It?